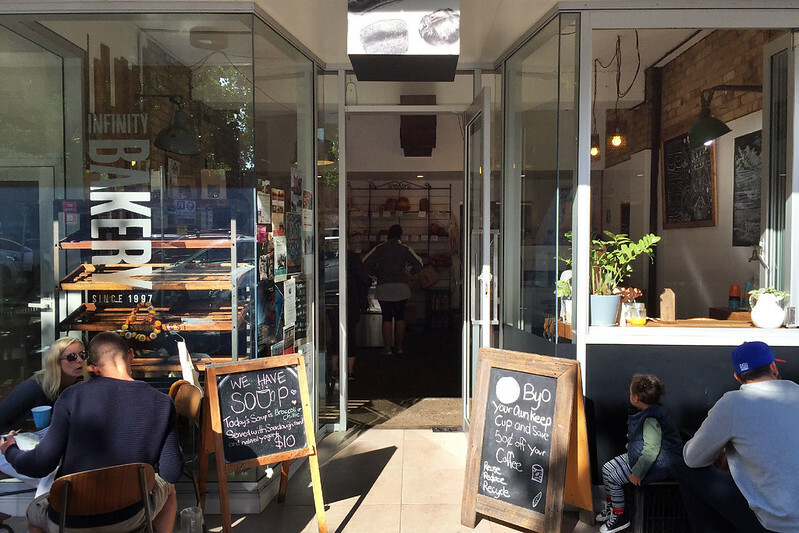 Continuing my quest to check out what are reputed to be some of Sydney’s best bakeries, I made the trek to Manly to try Infinity Bakery. This is a small shop located in the laneway running parallel behind the Corso, Manly’s main pedestrian thoroughfare, so it’s hidden away from much of the tourist foot traffic. The Manly outlet is one of three Sydney locations, with other shops in Paddington and Darlinghurst. 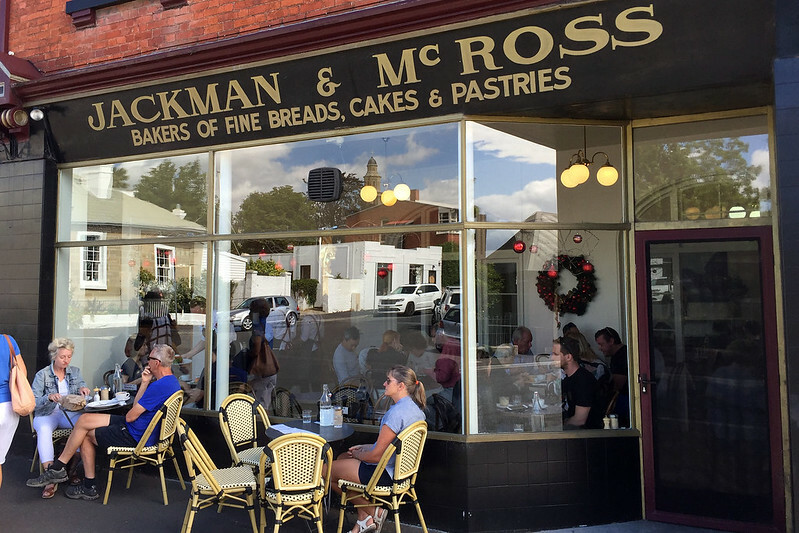 There are a few cafe tables, and a small selection of sandwiches and pastries (no vanilla slice, unfortunately), but mostly they sell loaves and bread rolls. But there’s also a warmer holding a few pies, sausage rolls, and two different types of vegetarian rolls (spinach and feta; and pumpkin, chickpea, and feta). I’d been wanting to visit this place ever since I first heard about it. 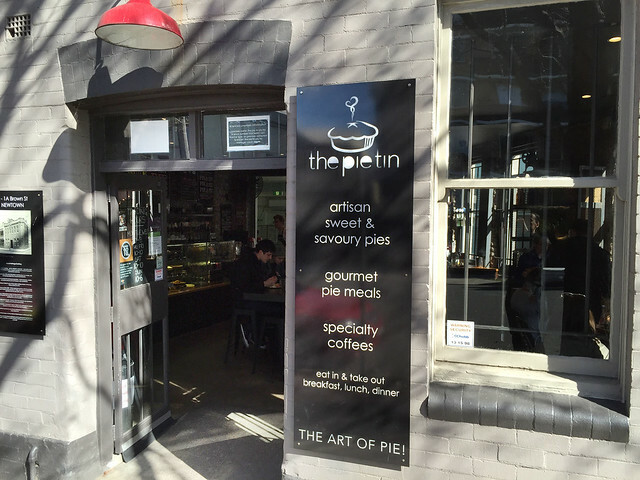 They do a big line in pies, as one might expect from the name – both the savoury, meaty Australian sort, and sweet dessert types. The establishment is tucked away in a little side street off Newtown’s bustling King Street restaurant and university student shopping strip. If you didn’t know it was here, you’d probably never notice it unless you are a local to the area. On a sunny winter Sunday I sought out the address and ventured into the old brick building, painted a neat light grey on the outside. The interior is funky and modern, with two large display cases arranged at right angles. The right one contains hot savoury pies of several different varieties, while the left contains sweet pies. Some of the hot pies on offer include: steak, cheese, and smokey bacon; lamb and rosemary; smokey beef brisket and mushroom; Sicilian style chilli lovers sausage and white bean; creamy chicken with hot seeded mustard and mushrooms; vegetable and lentil; sweet roasted duck with Cointreau and seasonal vegetables. While the sweet section has: Black Forest meringue; whipped lime; brown butter pecan; American style pumpkin; banoffee; creamy coconut custard; lemon brulee; Mississippi mud; and “the apple pie that ate Newtown” – an apple pie roughly the size of a car tyre, I kid you not.